Jay Maccarella, PT, MSPT is thrilled to open Bacharach’s 18th outpatient physical therapy center. Jay Maccarella, PT, MSPT, was an active athlete in high school – the quarterback of the football team and the catcher for the baseball team. But, an arm injury during his sophomore year changed all that. 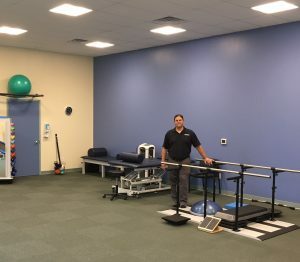 Jay graduated from Boston University with his Master’s in Physical Therapy and since then has accumulated more than 20 years of experience in a variety of areas of physical therapy, including acute care, home therapy and orthopedics. Bacharach’s Marlton location is dedicated to helping patients facing sprains, strains and other orthopedic injuries, as well helping those recovering from stroke, concussion, chronic pain and any other diagnoses. Jay applies his years of experience to help people of all ages, from young athletes to seniors. “I became a physical therapist because I wanted to help people, and I love working with young athletes like the ones facing the challenges I faced. I know what it’s like to be in their shoes and how it feels to be stuck on the bench or in the training room versus running out onto the field with your teammates,” Jay added. The Marlton location is located at Plaza 70, 63 East Route 70 and is open Monday, Wednesday and Thursday from 9 a.m. to 7 p.m.; Tuesday from 9 a.m. to 3 p.m.; and Friday from 9 a.m. to 1 p.m. To schedule an appointment at the Marlton location, call 856-334-5177.